Don't be alarmed, good citizen, they're on official business! 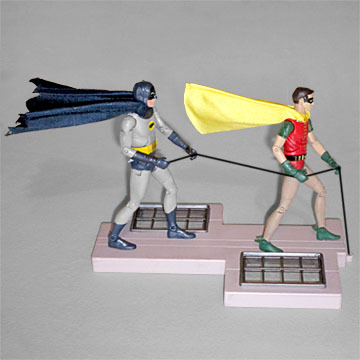 Batman and Robin limber-up with a climb while on the hunt for Gotham Citys's fiendish villains. Carefully ascending the building, as one must never sacrifice safety for speed, the Dynamic Duo encounters the most most fascinating people. You never know who might pop out the window to say hello! One of the most memorable gimmicks of the Batman TV show (after the animated sound effects) was the "turn the camera sideways and pretend they're climbing a wall" schtick. It was something that was both A) uniquely superheroic and B) dirt cheap, which put it right in the producers' sweet spot. It also allowed the show to have special guest stars (often other ABC stars the network wanted to promote), which was a nice bonus. 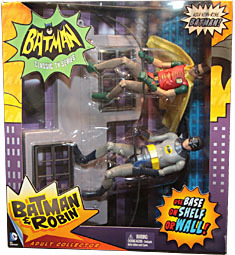 Now that they're finally able to make toys based on the 1966 Batman, Mattel wasted no time in releasing a box set that shows Batman and Robin climbing. It's a really nice presentation, with a tray holding the figures in their horizontal pose, and the angled backdrop looks like tall city buildings. It's a very nice presentation, but ultimately, it's the figures that matter. We start with Robin, because he's at the top of the rope. Why did he always climb the rope first? So Batman could be behind him! Don't worry: unlike what weirdos and lazy comedians would have you believe, it's nothing perverted; it's just that Batman is stronger, so if Robin should lose his grip, Batman would be there to catch him! Because if Batman has one consistent trait, it's what, class? That's right! He plans ahead for everything. Anyway, Robin's costume on the show was virtually identical to the one he wore in the comics: a red tunic with green sleeves, green gloves and boots, and green trunks. Since the television censors weren't crazy about shoving bare man-thighs into viewers' faces every week (metaphorically speaking), the TV costume also had the addition of skin-colored tights, and thus the figure's legs are slightly darker than his arms and face. And the face is what really matters. 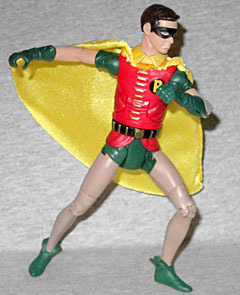 Mattel could have made a toy that looked "kind of" like 1966 Robin any time they wanted - it's the likeness that counts. And this figure's likeness is pretty good. A lot of the load is carried by the shape of the hair and the black mask, but there's enough Burt Ward in the face to make it clear who it's supposed to be. The figure is very skinny - almost extraordinarily so! Of course, the important thing to remember is that this is based on a real-life human, not an idealized comicbook hero, and the proportions are accurate to the way Ward looked in the suit (other than the famous bulge that required him to wear a dance belt and two pairs of underwear to hide it from the camera). The figure has a balljointed head, swivel/hinge shoulders, swivel biceps, hinged elbows, swivel wrists, hinged torso, H-hips, swivel thighs, hinged knees, and hinged ankles. And I'm not sure, but I think the shoulders are swapped: the shape of the lower edge of the sleeve doesn't match up with the shape of his arms. And while we're on it, why does Robin not have double-hinged elbows and knees? Adam West has had an action figure before, thanks to his role as the mayor of Quahog, Rhode Island. And if you want to count The Gray Ghost, that's two. But back in January 2012, when it was announced that Warner Bros. Consumer Products was finally going to be able to use more than just the logo and opening titles of the Batman TV show, we knew we were finally in for the good stuff. Just as with Robin, Batman's costume is functionally identical to what Batman wore in the books at the time. 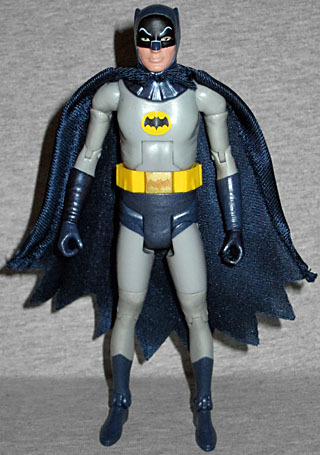 His costume was redesigned in 1964's Detective Comics #327, with the only substantial change being the addition of a yellow oval around his bat symbol (allegedly done to make it more trademarkable). Of course, the tone of the stories changed too - doing away with all the goofball stuff and going back to Batman's darker roots - but producer William Dozier read a few random old issues for inspiration and thought the campy Batman was the way to go. So the reason nerds today are embarrassed by Batman isn't because the show wasn't true to the comics, but because it was. There's even less of Adam West's face showing than there was of Burt Ward's (which, incidentally, was the reason West could have a stunt double, while Ward did most of his own stunts), the likeness is just as good. It's stronger in ¾ view than head-on, but it's still good. The ears on his cowl look stitched on, and the eyebrows and nose are light blue. Adam West was actually in pretty good shape, not that you'd know it from looking at him: while these days we have sculpted rubber suits to help define the anatomy of the actors who wear them, the 1966 Batman was just wearing cloth. His limbs are nearly as skinny as Robin's. His cowl and his cape are separate pieces, just as on the show: you can see how the cowl bunches around his neck as it lays against his chest. He wears his utility belt very high, as was the style at the time, and the buckle has two different tones of gold - one for the buckle, one for the bat symbol. He has all the same joints as Robin, and again we're left to wonder why there are no double-hinges. 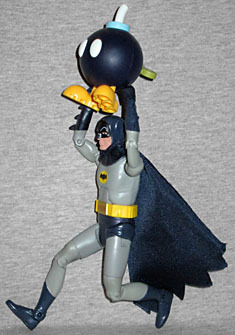 The SDCC exclusive Batusi Batman had them (and apparently some kind of dancing action feature? ), so why the great holy hell does the regular figure not? 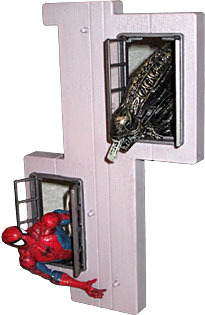 We mentioned that the packaging is designed to make it look like these figures are climbing a wall, but that's not all: the set actually comes with a wall for them to climb! Yes, it's a plastic display base, shaped like a (very irregular) chunk of Gotham City highrise. It can lay flat or be hung on vertically thanks to the nail hole on the back. It measures 8⅞" by 5⅜", and is ¾" thick. 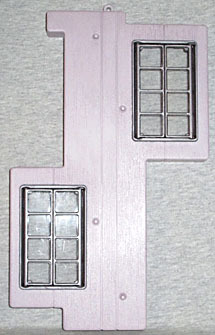 The wall has a slightly rough texture, and there are two windows. The windows, by the way, open. They're hinged on either side, and split in the middle. That means you can pop them open (seriously, pop them: they're very stiff) and have Batman and Robin encounter whatever guest stars you want. Ideally that would mean other 6" scale figures, but that will require some clever work on your part - we told you the base is only ¾" thick, right? Hard to fit (most) figures in that space. You'll either have to set up some kind of shadow box thing, or settle for printouts. There are four footpegs on the wall, so you can mount Batman and Robin on there. There's a loop at the top of the wall that a line could be threaded through, if the set included a line. It includes a batarang with a hole in one side, but no string. And there appears to be a line included when you look at the box, but that's just rolled paper, like the recyclable twist-ties Hasbro uses. You can continue to use it if you want, but be careful with it. And good luck getting it through the loop. Of course, since the figures' hands are open fairly wide, it's not like they'd be able to clutch a string anyway. You'd have to wrap it around their hands a few times. The footpegs hold them securely for now, but don't count on that being a permanent solution. Finally, to fully re-create the ridiculous style of the show, Batman and Robin have cloth capes. While the normal, single-carded releases will have the same thing, these capes get the added benefit of flexible wires stitched into them to create some poseability. That means you can flip the capes out behind them even when the "wall" is laying flat on the ground, just like the special effects available to the directors in the '60s. Emphasis on the "special." For whatever reason, Mattel has opted to put giant tags on the inside of the capes. Yes, they're softgoods, but Mattel's released plenty of cloth capes without tags in the past. I grew up watching Batman in syndication, so I have a soft spot for its camp silliness even if it's not the way I think of the "real" Batman. These figures are slightly better than the average Movie Masters release (and a lot better than certain ones), even though Mattel did its usual confusingly stupid job on the articulation and there's no string for the Batarang. You can get Batman by himself on a normal card, but getting this set - with Robin and the fun little wall for them to climb - is a better way to go.